Bumper sticker in the year 2015? 2025? Ever? You head out the door and down to the street to catch your ride to work. The aircraft is waiting. The only sound is the low hum of ducted fans at the rear. Where you’d once expected a pilot, there is instead a panel of blinking lights. To the left and right, more vehicles drop out of the morning sky to pick up your neighbors. You wave a card that opens the door, enters your destination into the flight planner, and debits your account, then spend the quiet, 20-minute commute reading, dozing, or sharing a laugh with your seatmate. The scene sounds like a fantasy because, despite great interest and the effects of “The Jetsons” cartoon on a generation of youth, the promise of affordable, automated flying commuter craft remains unfulfilled. True, there are a plethora of small flying craft around—light sport and ultralights—but there is still no aircraft that, compared to a car, is as easy to operate. Designs for flying cars have been with us for decades, but no drive-fly vehicle designs have ever been submitted to the Federal Aviation Administration for certification. In recent years, however, U.S. government agencies and private enterprises around the world have been developing the seed technologies that may finally give rise to this new form of aviation. The scenario of replacing cars, buses, and trucks with flying vehicles will be preceded by the introduction of propulsion systems and other technologies involving automated flight. In the United States, the gurus of flying cars are researchers at NASA’s Langley Research Center in Virginia who have recently completed a four-year study of the possibilities of personal air vehicles. While NASA’s research funding of such craft is ending, veterans of the program say that much of the technology that is needed to launch the industry is either available in the private sector or achievable in the near term. What would follow fast on the tail of an unmanned pizza delivery pod would be a commuter version: “Think of unmanned aerial vehicles with humans as cargo,” Bushnell says. He envisions an air vehicle that can also drive on the ground, yet still costs less than $50,000. “It will not fly high and not very fast—say, 120 knots [138 mph]—and feature a two-passenger climate-controlled cockpit,” Bushnell predicts. Even in sparsely populated areas, the vehicles will also have to be quiet. Many personal air vehicle proponents see ducted fans as the solution, since they are quieter and lighter than either propellers or rotors. The progress is quantifiable: In late May the FAA issued an experimental airworthiness certificate for the first vertical-takeoff, hover-capable aircraft with ducted fans. The 65-inch GoldenEye 50 is a winged design that uses a propeller enclosed within a cylindrical body to hover. It was designed by Aurora Flight Sciences Corporation of Manassas, Virginia, under a Department of Defense contract as a platform to carry battlefield sensors. It’s just a matter of time, the company is gambling, before there will be a need for larger aircraft using the same technology. 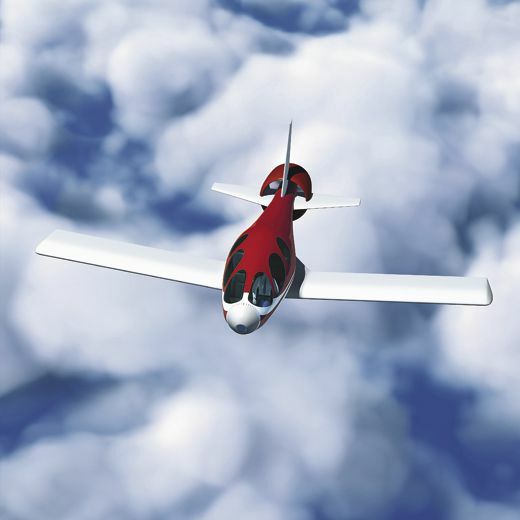 The GoldenEye 50 was designed as a technology development platform for the GoldenEye 80, a 150-pound ducted-fan aircraft.